Scott Rieker is a Doctoral student in Choral & Sacred Music at the University of Southern California and the Choir Director at Emerson Unitarian Universalist Church in Canoga Park, California. 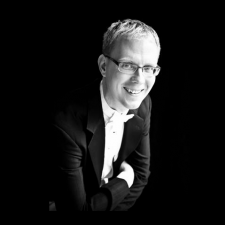 Prior to this position, Scott directed the Big Red Singers show choir and was assistant director of the Varsity Men’s Chorus at the University of Nebraska-Lincoln, where he earned a Masters Degree in Choral Conducting. Before coming to UNL, Mr. Rieker taught music in the Des Moines (Iowa) Public Schools, where he spent five years teaching at Meredith Middle School and three years at Hoover High School, followed by two years at Pleasant Hill and Phillips Traditional Elementary Schools. Choirs under Scott’s direction were invited to sing at Iowa Governor Chet Culver’s Inauguration, the Iowa Education Association’s 2009 Read Across America celebration, and the annual Martin Luther King Jr. celebration for the Des Moines Public Schools. While teaching in Des Moines, Mr. Rieker was awarded an NEA Innovation Grant in 2006 to develop a student-centered General Music curriculum for use in his school for 6-8th graders, based on Orff Schulwerk, composition, world music, notational literacy, and multi-media learning and presentation. Scott served as the Director of Music at St. Mary’s Cathedral in Grand Island (Nebraska), where he was tasked with overseeing a renaissance of the liturgical music program there. During his tenure, Scott was responsible for arranging, rehearsing, and directing the music for the ordination of Bishop Joseph Hanefeldt; only the second time an episcopal ordination has occurred in Grand Island since 1978. Previously, Scott served as Director of Music at the Basilica of St. John in Des Moines for seven years, where he was responsible for a choir of more than 50 voices, instrumentalists, and cantors. His choirs recorded a CD in 2011, regularly performed works by Palestrina, Bach, Josquin, Lauridsen, and was one of four selected to perform with the American Guild of Organists’ Convention in Des Moines in June, 2011. As President Elect and President of the Iowa Music Educators Association, Mr. Rieker regularly travelled to Washington, DC to advocate to Iowa’s congressional delegation, as well as testified before the Iowa House and Senate. Scott is now a Past-President of the Iowa Music Educators Association.